If you are looking for a comfortable business casual dress pant that you can wear to work, there are lots of outstanding options that will keep you looking great, and that will be suitable for most workplaces. Everyone has different body types and preferences about fit and styles, but we have gathered together a list of some of the most popular and comfy pants that have become classic business dress pant that will work well for most women. If you are serious about comfort, you will want to check out Betabrand Dress Yoga Pants. Everyone knows that yoga pants are one of the most comfortable clothing items going, mainly due to the type of fabric that they are made from. So Betabrand has taken the traditional yoga pant fabric (68% rayon, 27% nylon, 5% spandex) and created a dress pant. This pant looks dressy, but its main selling point is that it is comfortable. It is also machine washable and is made from a good quality, yet durable fabric, so they should last for quite a while, even with the machine washing. The pant comes in quite a lot of different fits, fabrics, lengths, and colors, so most women should be able to find a style that is right for them. The Betabrand pants also have details on them like belt loops, faux zippers, and pockets to make them pass as office wear, while still feeling like you are wearing yoga pants. 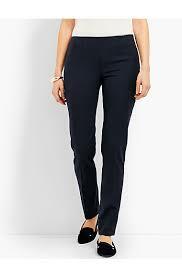 Another really popular staple for a lot of women, especially younger women, is the Express Columnist Ankle Pants. I’m not overly familiar with this pant myself, but when talking with a friend about her favorite work pants, she couldn’t stop gushing about how great it is. Not only is it comfortable, but it wears well. It has the right amount of stretch and comes in lots of different fits, lengths, colors, and patterns. They also aren’t overly expensive if you get them on sale. 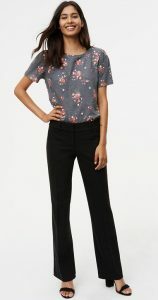 If you aren’t sure where to start with this line, check out the Mid Rise Columnist Ankle Pant, it is quite a flattering fit and versatile pant that can go quickly from day to night. Talbots has a reputation being a store for kind of an older crowd, but they actually make excellent quality, figure flattering pants for women of all ages. Talbots pants come in a bunch of different cuts, colors, and lengths. They go on sale often, and if you get the pants on sale, you can get a pretty good deal for the quality you are getting. Many of their styles are machine washable, which is a great thing if you are wearing pants daily. 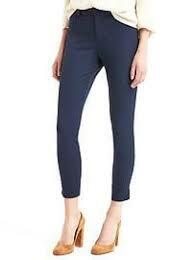 Talbots pants also have a reputation for being extremely comfortable, while still looking suitable for whatever you are wearing them for. One of Talbots most popular styles is the Refined Bi-Stretch Side-Zip Straight-Leg, this is a very slimming style that looks great for work or a night out. You know that a pant that is called ‘Ease into Comfort Pants’ have got to be comfortable. Rekucci have a couple of different fits in this line, with one of their most popular styles being the Barely Bootcut Stretch Pant. Despite having no pockets, buttons or zippers, they still manage to look appropriate for the office. They’re stretchy, so you just pull them up, and they have elastic inside the wide contour waist that can give you support and smooth out the look of the pant. The pants are machine washable but should be air dried. The best thing about this pant is the price; they run from between $15 -$40, depending on sizing and colors. 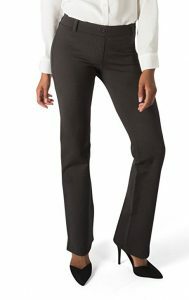 The Banana Republic Sloan Fit Pant comes up again and again as one of the most popular and comfortable dress pants for work. They are offered every season in different patterns, colors, and fits, with the basic design remaining the same- fitted through the hip, thigh, and leg and made from sculpting, stretchy fabric. 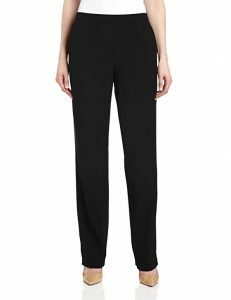 For most women, this is a very flattering and slimming pant; the key is the fabric which is stretchy in all the right places while still being super comfy. The Sloan can be a little pricey, so watch for sales or check the outlets for deals on this style. While this style is comfortable for most women, they can be a little tight in the leg, almost like a legging but they still manage to look professional. If you like a looser leg, this isn’t the style for you. Most BR pants are dry clean only, so if you want a machine washable pant, there are better options. 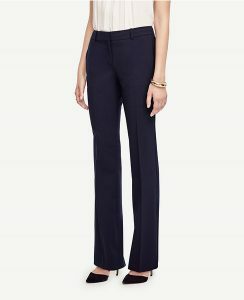 Ann Taylor is one of the best places to get a high quality, black dress pant for work if you want to look professional. Their styles are changing all the time, but most of their styles and cuts are incredibly flattering for many body types, and they feel like a dream to wear. 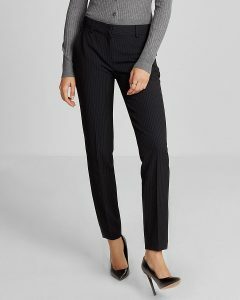 The Ann Taylor Kate or the Ann fit trousers are lovely if you are looking for something a little dressier, especially if you are planning on wearing the pants with heels. They are a bit pricey compared to other styles on this list, but they will last for years, and you should be able to get a lot of wear out of them. Everlane has a lot of very comfortable clothes, and these Italian GoWeave Easy Pant are no exception. They are 100% wool, which may be a turnoff for a lot of people as far as comfort goes, however, the GoWeave wool is reported to be very smooth and soft as well as being wrinkle resistant. They are a relaxed fit, and they come with an elastic waistband, which is usually a sign of a style that is going to be comfortable. The style is very professional looking and easy to wear. The only downside is that since they are wool, they will have to be dry cleaned. Everlane also introduced a new $50 work pant on January 25, 2018, and it had a 12,000 person wait list before they even became available. Anyway, they are sold out until June 10, 2018, but if you are interested, you can find those here. A favorite comfort pant that is available on Amazon is this straight-leg pant with a hidden-elastic (elastic!) waistband from Briggs New York. It is a loose fitting style that is very flattering for larger sizes or those who just like a looser fitting pant. It has side slant pockets, and the material is a polyester rayon and spandex mix. It comes in 4 colors that work well for the office. This is a decent, dressy slack that is comfortable and doesn’t cost very much if you are on a tight budget. They are also machine washable and okay to put in the dryer. Another bestselling fit from a popular brand is the Julie fit from Loft. The Julie fit comes in a bunch of different styles and colors, but the essential design feature is that it is a little bit looser in the leg, which is excellent for those of us who are getting tired of all the skinny leg options that you can’t seem to get away from these days. They are dry clean only. These are one of my favorite work pants, mostly because they are pretty flattering and not wildly expensive. The fabric on the pairs that I own isn’t the softest that you are going to find, but I don’t find them uncomfortable at all. This is one of Gap’s most popular styles, so the material, colors, and designs are changing season to season and year to year. This style looks very classy and dressy, so it works well for the office. The material seems to be pretty good quality and thick so it should last for years. I don’t usually like skinny styles of pant, but the Bi-Stretch is pretty comfy and fairly flattering for most body types. White House Black Market’s Ponte line of pants are a favorite of a lot of people, mainly due to the comfort of the fabric and the fit of the pants -they tend to be very slimming. They come in a few different shapes for different body types. Their boot cut style works well if you have an hourglass figure. They are made from a material that is very soft and smooth, but they still feel durable and like they would last a long time. Some people say they feel like you are wearing sweatpants, this seems like a bit of an overstatement, but they are soft. 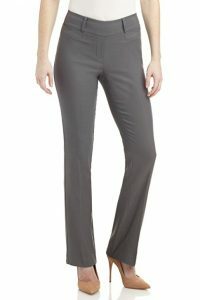 If you are someone who loves a skinny fit and want a pant that will work well for the office, Dynamite has a very popular skinny dress pant called the Kate Skinny Pant. These pants work exceptionally well on women who have a small frame. They are very versatile and can go from day to night pretty smoothly since they look quite dressy. They are very stretchy and comfortable to wear, so they are an excellent choice for those who have to move around a lot at work, while still looking professional.